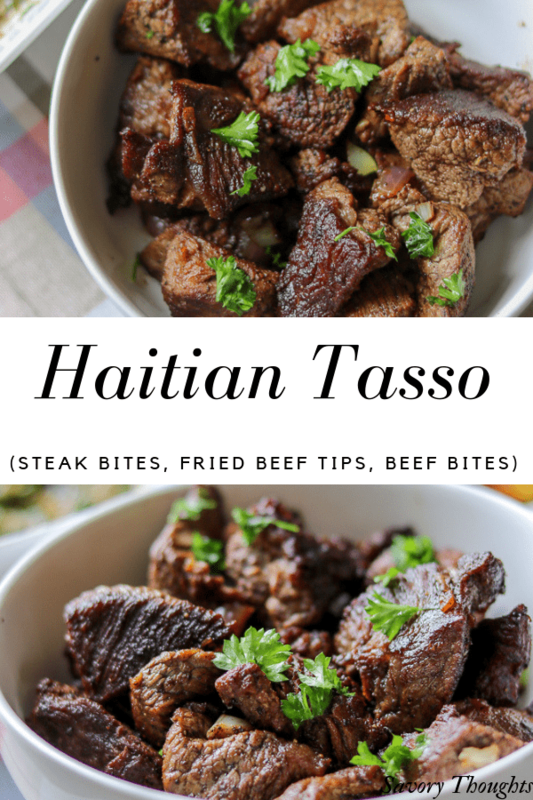 Haitian Tasso is famous in Haiti. 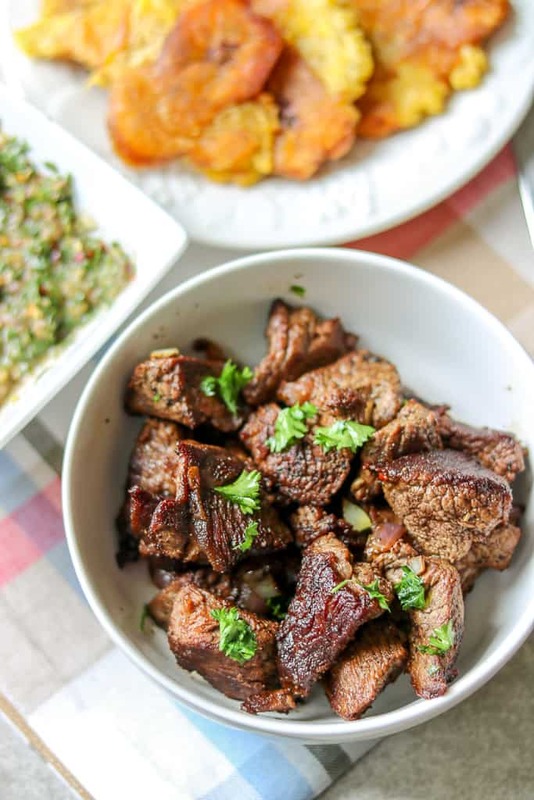 In other parts of the world, they are called steak bites, fried beef tips, or beef bites. I call them mouthwatering! Not to mention they are gluten-free! Savory Thoughts: Love is patient and kind. 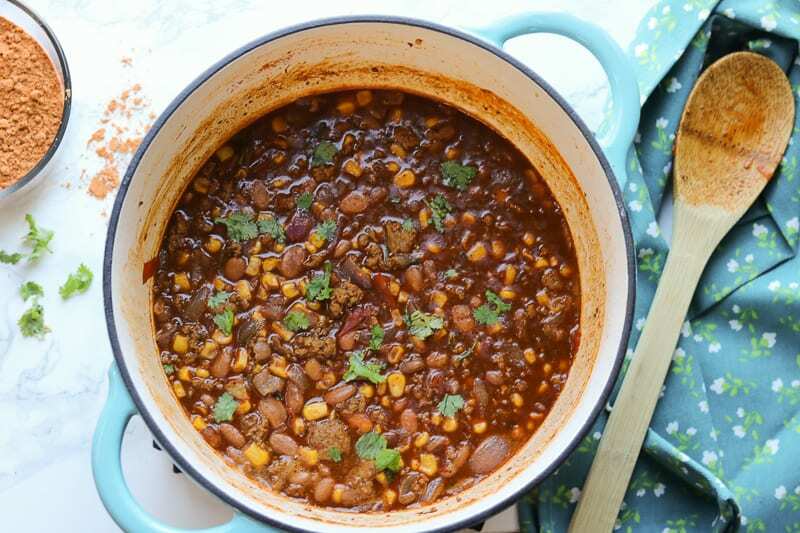 Patient and kind – that’s the power of comfort foods! These Tassos are so fun and easy to make. They also go a long way with fried plantains (Bannan peze). 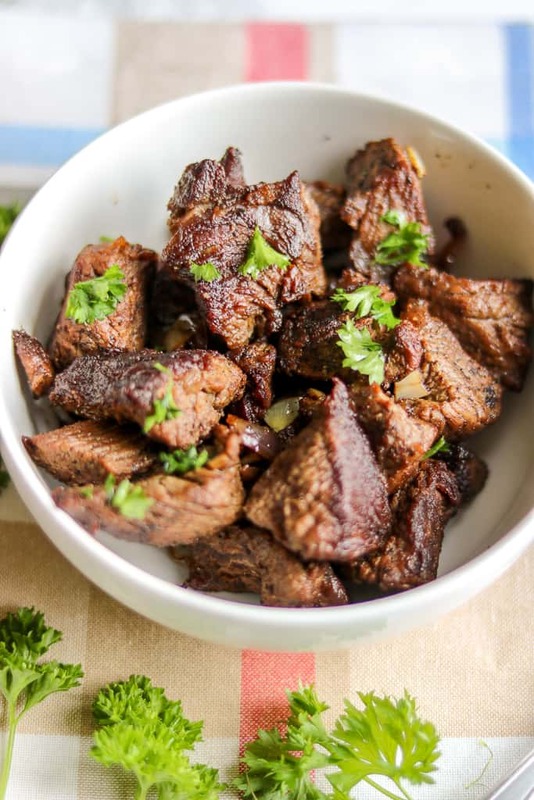 Haitians go crazy for these little steak bites! 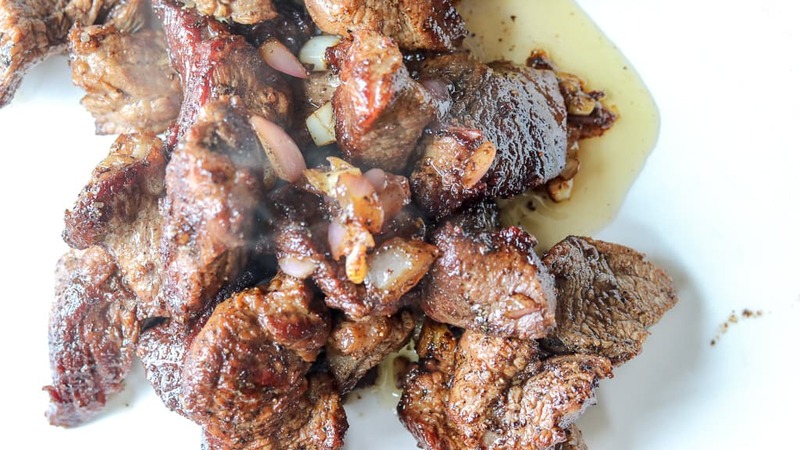 In Haiti, it is not uncommon to find vendors, especially at night making these fried beef tips. They are usually served with of course plantains, fried sweet potatoes, and pikliz (pickled coleslaw), and a cold drink! Just like most foreign foods, Haitian foods can also be complicated. But it doesn’t have to be. I found a trick to simplify most of our foods and techniques. 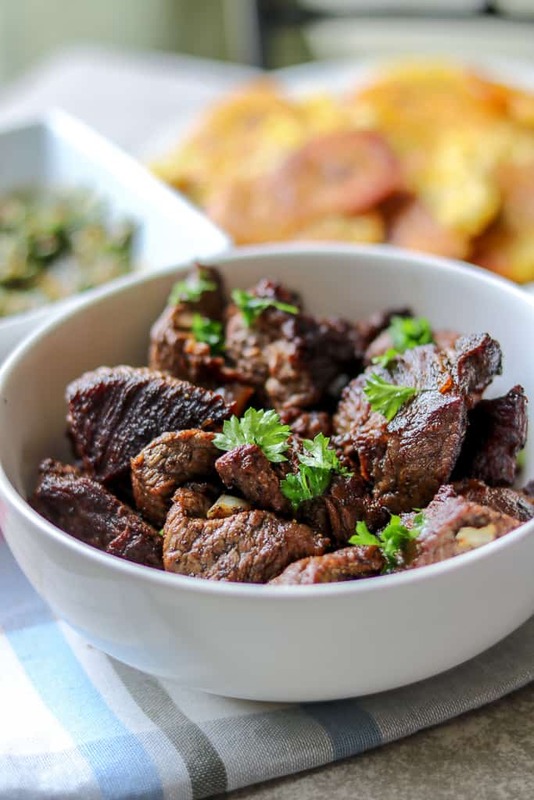 For example, in this Haitian Tasso recipe, I used sirloin steak instead of beef cubes, which are typically used to make beef stew. Don’t get me wrong, I sometimes use the cubes as well because they are pre-cut, which means all the hard work is already done for me. However, for a much more tender meat, I find that sirloin steaks or any high-quality steak cut work best. 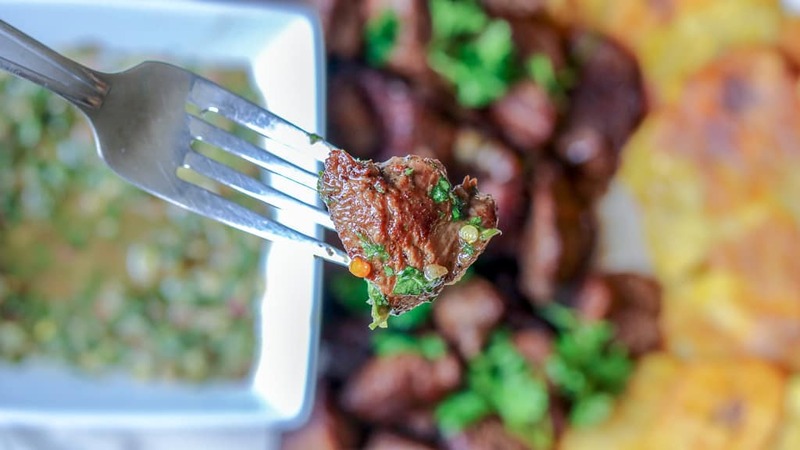 These beef bites are also very tasty with chimichurri sauce. 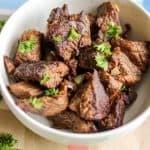 How to make Haitian Tasso (steak bites, fried beef tips, or beef bites)? I always start by cleaning my meat with vinegar. Why? Well, coming from a hot Caribbean country, bacteria tend to flow around much more. So, to avoid any food born illnesses, we often wash our meats and vegetables with vinegar and or lemon/lime. 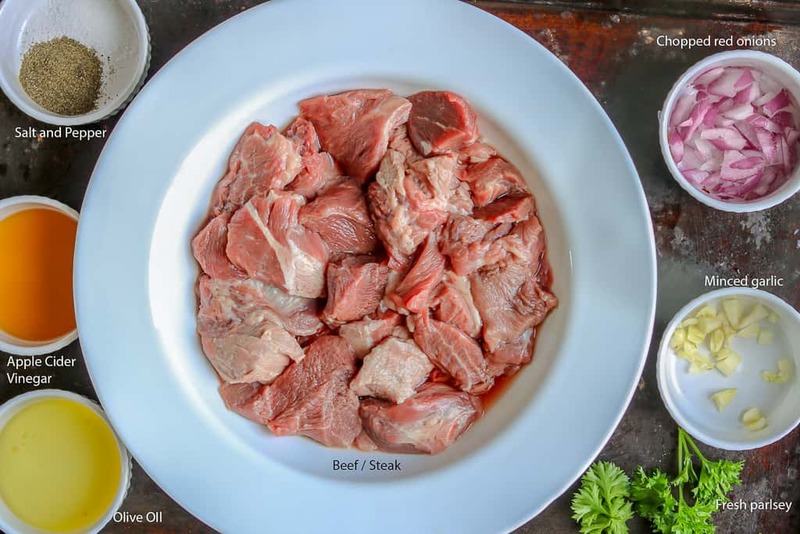 To start, I cut the meat in small cubes and wash the beef with vinegar, then rinse it with warm water. Afterward, I personally like to let the meat sit in distilled vinegar again for 1-2 hours. It makes the meat a little more tender. I only use this method if I am using the beef cubes. I have different ways to use the vinegar depending on the meat I am preparing. Next, season the meat and let it marinate. Afterward, pan-fry the meat until golden brown on all sides and cook according to your level of satisfaction in a heated skillet. My husband like medium rare steaks, so I would make his batch first, then I’ll complete the rest by cooking it medium well, or well if the kiddos are eating it too. Then repeat the process until you are done. Be sure to cut off any fats, remove any silvery membrane too. However, a few pieces with a little fat doesn’t hurt either. Cut and wash the meat. Set aside. Place the meat in the pan in a single layer. It will sizzle loudly when it first touches the pan. Drain any excess fluid. Start turning the meat when it is brown on one side. Add all of the ingredients and stirring in between. 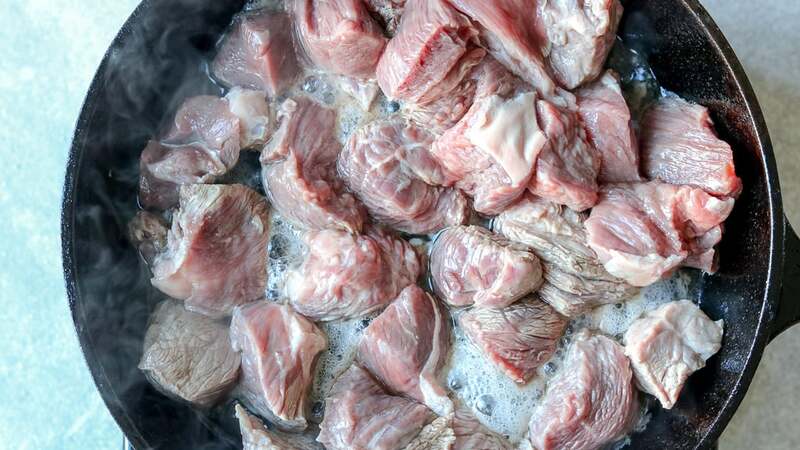 Cook the meat until brown on all. Cook the steak to your liking. Should be at a minimum of 3 minutes per side, and a little more for well done. This sounds so simple and delicious! I don’t know much about Haitian food, but love to learn about new cuisines. Glad I stumbled across this! These steak bites look so delicious! Thanks for the tip of using vinegar to wash off any bacteria. You are welcome, Julia. Thank you for reading. 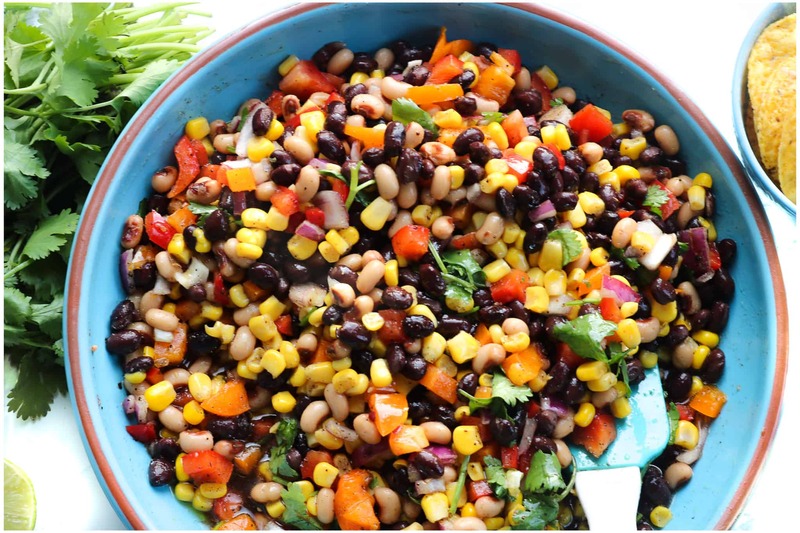 Homemade meals are always much more appealing aren’t they and this is a nice easy recipe. These steak bites look so delicious and juicy! YUM! These look wonderful! I love steak bites! I’ve never heard of washing meat in vinegar before, but I do live in a cold and wet country, so it’s probably not necessary! Does it alter the taste at all or does it just make it tender? I must say I sometimes struggle with beef if it’s chewy, I much prefer my beef to be tender so I may have to try putting it in vinegar! Yes, Annie! 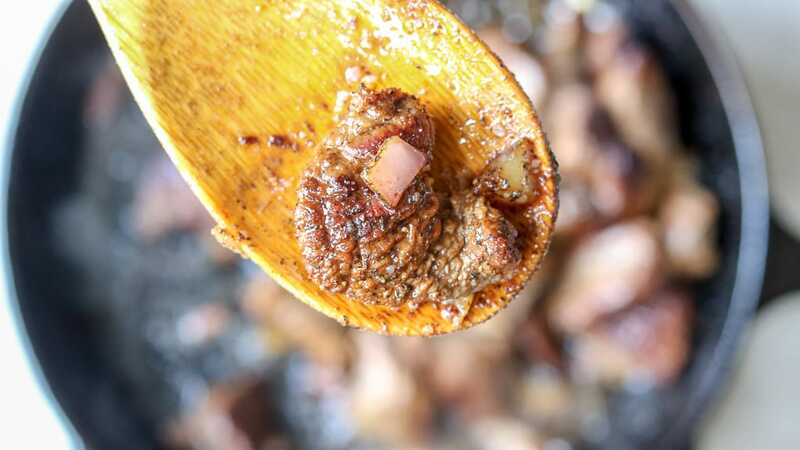 It does alter the taste if it is soaked for too long (over 24 hours) However, for just a few hours, it does make the meat a little more tender. I personally do not mind a little acidic taste. However, if you are not used to it, I would not recommend it. 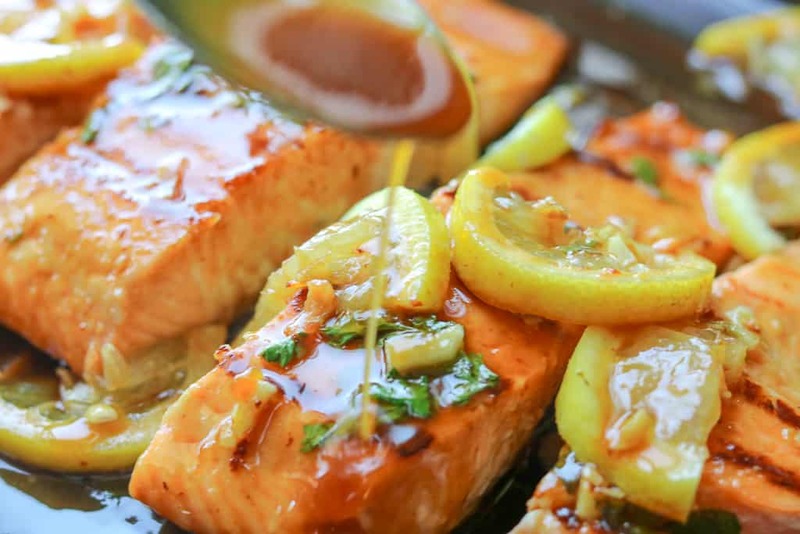 Such a simple weeknight meal! Oh wow, I’m drooling at these photos! I definitely need this in my life. Looks so flavorful! Thank you, Jean! Yes, it is very flavorful! You will love it. I am a beef loving gal, and this looks Ah-mazing. Plus, sirloin is such a great, versatile cut that is lean yet tender! Exactly! To make something like this in such little time, you need a great cut meat. The beef cubes would work too, however, it requires a little more care to make it tender. 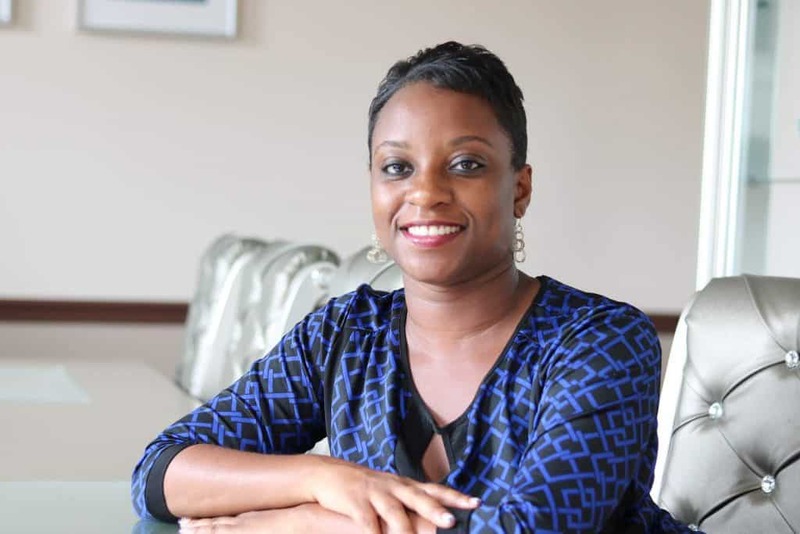 Thank you for reading, Jennifer! they look so good! I bet they make the best party dish to share with friends, too! I never knew about washing meat in vinegar. Interesting idea and thanks for sharing. You’re welcome! It’s just a little something I learned while growing up in Haiti. It has stuck with me. This looks and sounds SO delicious! I’ve never heard of it, but I can’t wait to try this recipe! I love how simple flavors can be so delicious. This sounds fantastic! Looks delicious = EASY too. These look perfect! Love the simple ingredient list too!! Yum yum yum!! 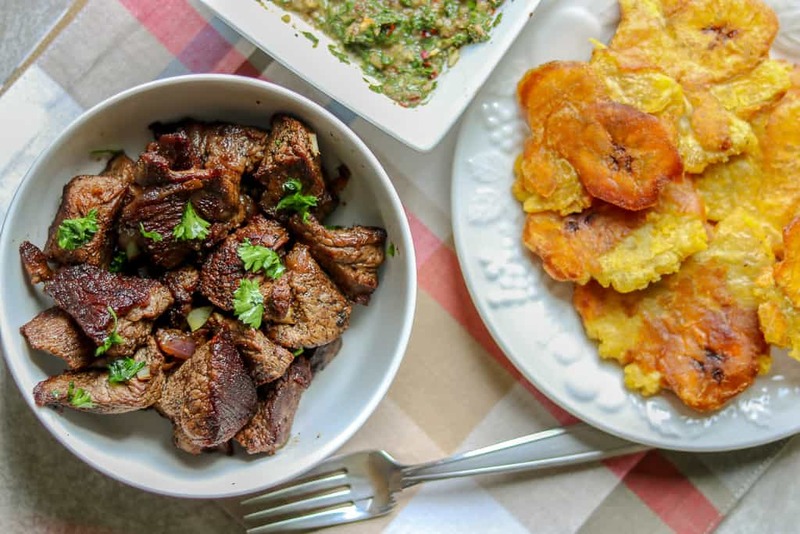 These looks so good, and that chimichurri + tostones along with these steak bites would be amazing!